A no-nonsense approach to eating clean for body and mind to get you looking and feeling great. 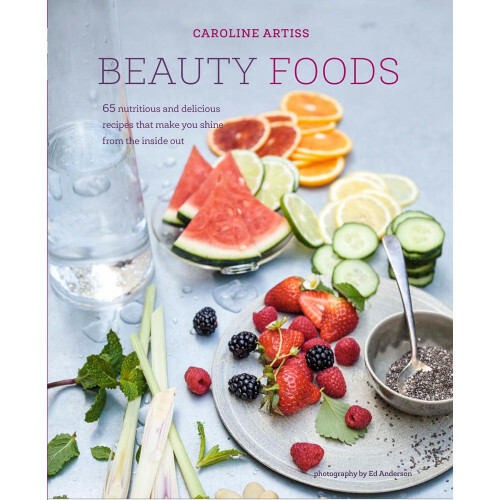 YouTube sensation Caroline Artiss starts with a diagnostic glossary of Beauty Ingredients that highlights the best things to feature in your daily food regime. She then offers a selection of fresh and inventive Drinks using everyday ingredients as well as superfoods, giving advice on the combination of ingredients as beauty treatments. Try an Avocado Smoothie, Baobab Lemonade or Coconut & Ghee Coffee. Next up, she'll help you to start the day right with Breakfasts including Save Our Skin Granola, Turmeric Scrambled Eggs and Gluten-free Breakfast Tacos. Snacks & Sides keep hunger at bay with ideas for Ancient Grain Crackers and Vietnamese Chicken Bites, as well as sides for super-sized meals or dinner parties, such as Salsify Mash and Sweet Potato Fries. Soups & Small Plates has all your bone broth needs covered and makes the most of fresh produce with ideas for Artichoke, Pea & Mint Frittata with Fermented Kefir or Carrot, Feta & Walnut Latkes. Larger Plates focuses on meals that won t leave you longing for more. Try Green Tea Coconut Chicken, a Chilli, Orange Tofu with Kale Salad, Chia Chimichurri Steak or Wild Mushroom & Amaranth Risotto. Finally, Caroline offers some truly delicious Desserts & Treats that you'll devour without the guilt. From Vegan Chocolate Truffles to Black Rice Pudding and Blueberry Crumble Pots you'll be spoilt for choice. Look no further for delicious recipes that do you good.